Windows gamers, rejoice -- Microsoft releases Xbox One controller drivers! I love First-Person shooter video games such as Call of Duty and Quake 4. For that genre of game, my trusty keyboard and mouse is the optimal way to interact with my on-screen character. However, for all other games like fighting, racing and platforming, I need and demand a quality controller. While there are many to choose from, the Xbox 360 controller has proven to be the most reliable and comfortable for many. Drivers exist for Windows, so gamers can connect it by USB or buy a wireless variant and dongle. Sadly, Xbox One controller drivers have been absent for Windows. This is puzzling as Microsoft is behind the controller and operating system. This new controller is wonderfully built and designed, so gamers have been eager to use it on their PC gaming rigs. Well, today the wait ends -- Microsoft has finally delivered the drivers we have been waiting for. "Beginning today, new PC drivers for the Xbox One controller will be available for download, offering PC gamers a better way to play using the Xbox One controller. We're planning to release the drivers as part of a Windows update in the near future; however, today, I am happy to offer early access to our dedicated PC gamers on MajorNelson.com", says Larry Hryb (aka Major Nelson), Microsoft. Hryb further explains, "we know our fans have wanted PC compatibility, and we know they wanted to be able to use the Xbox One controller with the same games and applications they have been playing with using the Xbox 360 controller. We can't wait for them to play their favorite PC games with what we consider the best controller ever made and we're excited for fans to experience the improved D-pad, redesigned battery compartment, new comfortable design and offset analog sticks. The new PC drivers will enable the Xbox One controller to be used with any game that featured gamepad support for the Xbox 360 controller. 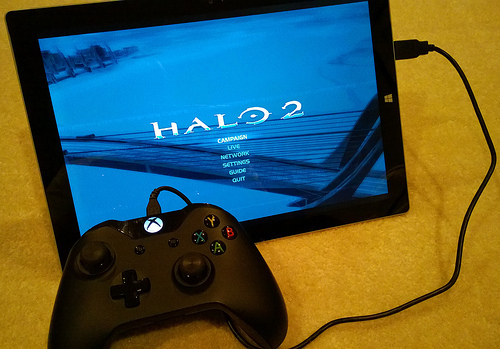 Simply download the drivers, connect your Xbox One controller to your computer through a micro USB cable and you’ll be gaming in no time". Of course, this is a wired-only affair for now. Hopefully Microsoft will release a wireless dongle in the future. Still, even wired, this is awesome news for people that play at a desk or with a laptop or tablet, where wireless is not a necessity. While I do not own an Xbox One, I will now be buying one of these controllers to hook up to my Surface Pro 3 and desktop. I can't wait to play Rayman or Halo Spartan Assault on the go with an Xbox One controller. You can download the 32-bit driver here and the 64-bit driver here. Tell me how the controller works on Windows in the comments.